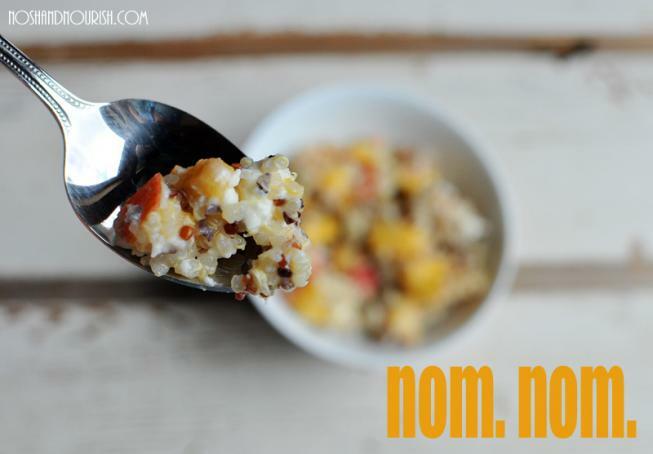 Did you know you're supposed to rinse your quinoa 7 -8 times before cooking it? I asked this same question to my thousands of Facebook fans, and many had never heard that, let alone done it!! 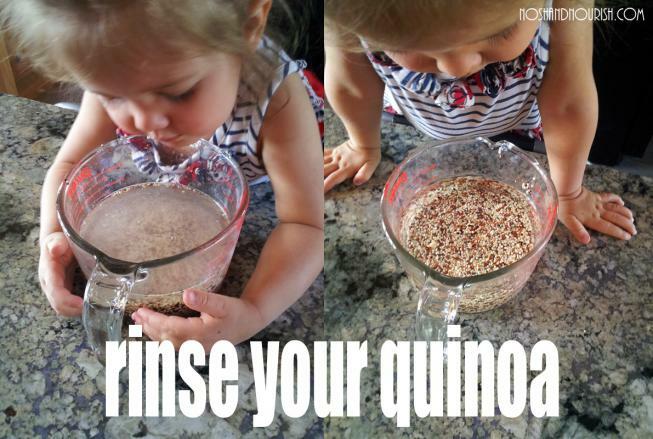 Why is it important to rinse quinoa? Because there is a detergent-like bitter coating on each quinoa seed, called saponin, which naturally protects the quinoa from birds and insects. If this is not rinsed before cooking, it can cause stomach aches, or even a more severe allergic reaction in a particularly sensitive human being. Some quinoa brands tout being "pre-washed," which is great, but I still will rinse it at least once to make sure the water runs clear. The left picture is quinoa after one rinse - completely cloudy. The right is after 7 rinses - finally clear. It's actually not super easy. The quinoa seeds are so small that a strainer isn't really that helpful. Soooooo, here's how you do it: I use a 4 cup measuring cup (as you see above)... 1 cup of quinoa, then fill up water almost to the top. Swish the water around with a spoon (or your hand), then carefully pour most of that water out. Repeat this process 7 -8 times... until it finally comes out clear! Be forewarned: I do lose a few of the quinoa kernels in the process (which is painful because of how expensive it is!!! ), but it's TOTALLY worth it in the end. 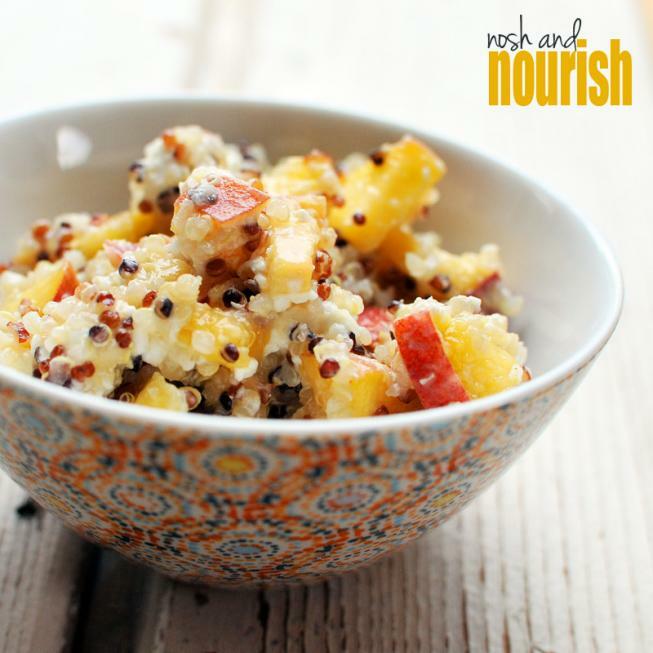 This Summer Quinoa Salad with peaches and goat cheese is the perfect accompaniment to your summer grilling. My favorite combo? This salad, with grilled corn on the cob and a salmon burger: yummola. It is light, fresh, colorful, and packed full of nutrients! Protein? Check. Fiber? Check. Iron? Check. Lysine? Check. Magnesium? Check. Calcium? Check. Vitamin A? Check. Vitamin C? Check. Potassium? Check. Honestly, I feel healthier just TALKING about this salad!!! Now that you know how to properly rinse and prepare this superfood, go ahead and make it a staple! Cook your quinoa per its instructions. Then combine all ingredients in a medium mixing bowl.